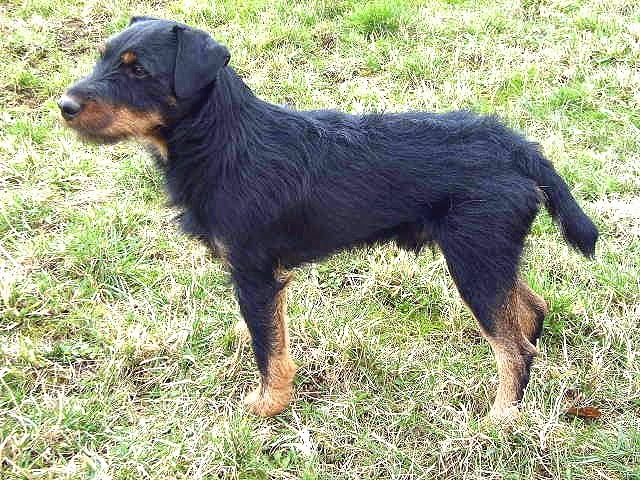 The Jagdterrier is a German working terrier also called the German Hunt Terrier. The breed was developed between the two world wars when German breeders had a strong focus on bringing back breeds and species from the nation's mythology. The strong nationalism and interest in genetic engineering didn't stop with dogs - breeders tried to recreate the primitive cattle and horses seen in cave paintings in France as well as bringing back an extinct species of zebra. In the midst of experimentation and nationalism, the climate was perfect to introduce a German Hunt Terrier that could compete with the British and American fox terriers. A massive breeding program rolled out. It included 700 dogs, and any dog that didn't look right or have the correct requirements was killed. It took ten years until the Jagdterrier bred true, and the dog was warmly embraced through the country. These dogs are known to be reliable, courageous, intelligent, and adaptable. They are small, but brave enough to hold their ground when faced with a bear or a mountain lion. Jagdterriers make good family dogs given sufficient exercise and mental stimulation, but they still have a strong hunting instinct and can take off in pursuit of perceived prey. In recent years, some Jagdterriers have been imported to the USA, but they are still rare here. Do your pets like to go in the car? Do you have a chewer? Are small dogs different from large dogs? Have you voted in the hero dog awards? Why do cats paw at the water dish?